Creamy and dreamy. Healthy and nourishing. Chockfull of protein, fibre and good fats from the chia seeds and filled with metabolism-boosting properties from the coconut oil. 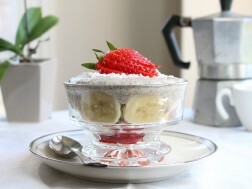 This guilt-free pudding makes for a healthy breakfast, snack or dessert, any time of day! No refined sugars are used as this silky treat is sweetened only with dates and a touch of pure maple syrup. Bonus: it requires no cooking making it super easy to make! Gluten-free, dairy-free, vegan, Paleo… and oh-so-delicious! Purée all of the ingredients (except optional toppings) in a blender (or food processor) until well incorporated. Pour the mixture into 4 small ramekins (or 2 larger ones) and refrigerate for at least 2 hours, or even overnight. Top with a fresh berries, or sliced bananas, and serve!